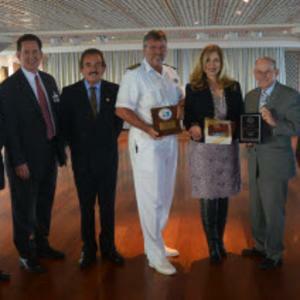 Port Everglades officials welcomed Crystal Cruises’ Crystal Serenity and her master, Captain Egil Giske, to the South Florida cruise port today at a traditional plaque exchange ceremony. “We are honored that Crystal Cruises has returned to Port Everglades to homeport your luxury ships after a 10 year absence,” Port Everglades Deputy Director Glenn Wiltshire told Captain Giske and Crystal Cruises executives Edie Rodriguez, CEO; Thomas Mazloum, COO; Hans Lind, Director of Operations; and Christian Sauleau. Sr. Vice President of Operations & Total Guest Satisfaction. “The Crystal Serenity is a magnificent ship and is one of the reasons Crystal Cruises has earned the distinction of being The World&apos;s Most Awarded Luxury Cruise Line™. The renovated 68,870 -ton, 1,072-passenger Crystal Serenity, part of a two year $52 million investment by Crystal, boasts a chic, contemporary style and several industry-firsts such as a chef&apos;s herb garden as part of "vertical walls" of greenery. Crystal Serenity’s November 8th sailing will be her only one for the 2016/2017 cruise season. She will return again in October 2017 with her sister ship, Crystal Symphony, for a full season of sailings from Port Everglades. In total for 2016/2017, Port Everglades will welcome 42 different multi-day cruise ships. Located in the second largest county in Florida, Broward County’s Port Everglades is consistently ranked as one of the three busiest cruise ports in the world with more than 3.8 million passengers in FY2016. The Port&apos;s wide-ranging fleet of cruise ships provides guests with an array of cruise vacation choices from the sunny Fort Lauderdale, Hollywood and Dania Beach area. View details on the latest cruise offerings at porteverglades.net or contact us by emailing PortEverglades@broward.org. PHOTO CAPTION: (L-R) Robert Flint, Director, Port Everglades Operations; Jim Pyburn, Director, Port Everglades Business Development; Christian Sauleau, Sr. Vice President of Operations & Total Guest Satisfaction, Crystal Cruises; Captain Egil Giske; Edie Rodriguez, CEO, Crystal Cruises; Glenn Wiltshire, Deputy Port Director, Port Everglades; and Karen Rech, Sr. Cruise Service Manager, Port Everglades.